Grout is a mixture of water and cement, with the addition of sand, finely ground gravel, and color. It comes eihter in a powder form, or ready as a premix. It’s used to fill in the gaps between the tiles, and can be used wherever you choose to install your tiles: on the floors, walls, backsplashes or countertops. 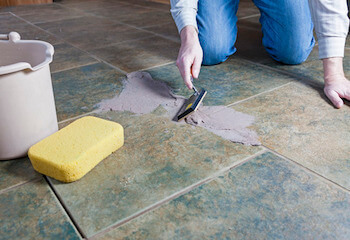 While discolored or dirty grout may be unattractive, if it’s in good shape the appearance can be changed. Start with a good scrubbing with water and a cleaner. Rinse and allow to dry. If it still has stains you can purchase a grout pen that will allow you to spread a layer of “paint” on top of the grout, giving it a uniform look. Two coats may be necessary for badly stained grout. If the grout goes beyond appearance, and shows signs of wear through cracking, crumbling, or is missing, you’ll need to remove it and either repair it in sections, or replace it altogether. Broken or cracked grout will not provide a barrier against moisture, and will allow water to seep behind the tile. This will eventually result in loosened tiling, and can cause mold to develop behind the tile. When the tile was installed, did you keep extra grout? If so, repairing can be a simple process of replacing it with existing grout. If not, you can bring in your grout to attempt to match it with a current color on hand. If you can’t find the perfect shade, it is possible to adjust the grout color slightly by adding more water for a lighter shade, less for a slightly darker shade. In some cases it may be better for replacement. To remove all the grout from the area and check to ensure the tiles are properly laid and maintained, hiring a tiling contractor can provide you with the best results. Have additional questions about your grout?